This book is split into four sections. 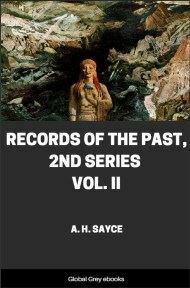 The Introduction includes chapters such as The Legend of Ra and Isis, The Legend of the Destruction of Mankind, The Legend of the death and resurrection of Horus and The History of Isis and Osiris. 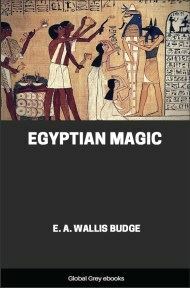 The second section is the Legend of Egyptian Gods and includes a Hymn to Osiris. 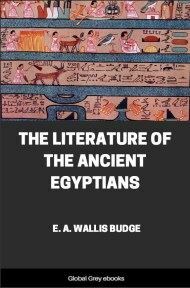 The third section, The Legend of the Death of Horus includes the narrative of Isis and finally, the fourth section, the History of Isis and Osiris includes explanations collected by Plutarch. 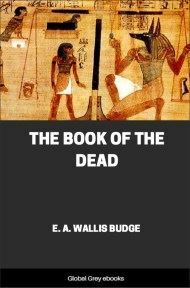 THE text containing the Legend of the Destruction of Mankind is written in hieroglyphs, and is found on the four walls of a small chamber which is entered from the "hall of columns" in the tomb of Seti I., which is situated on the west bank of the Nile at Thebes. On the wall facing the door of this chamber is painted in red the figure of the large "Cow of Heaven." The lower part of her belly is decorated with a series of thirteen stars, and immediately beneath it are the two Boats of Ra, called Semketet and Mantchet, or Sektet and Matet. Each of her four legs is held in position by two gods, and the god Shu, with outstretched uplifted arms, supports her body. The Cow was published by Champollion, without the text. 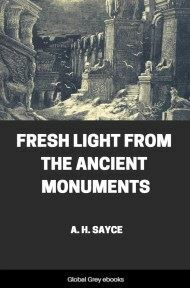 This most important mythological text was first published and translated by Professor E. Naville in 1874. It was republished by Bergmann and Brugsch, who gave a transcription of the text, with a German translation. Other German versions by Lauth, Brugsch, and Wiedemann have appeared, and a part of the text was translated into French by Lefébure. The latest edition of the text was published by Lefébure, and text of a second copy, very much mutilated, was published by Professor Naville, with a French translation in 1885. The text printed in this volume is that of M. Lefébure. 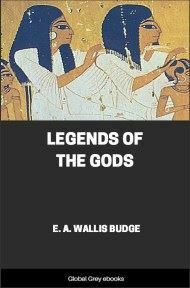 The legend takes us back to the time when the gods of Egypt went about in the country, and mingled with men and were thoroughly acquainted with their desires and needs. The king who reigned over Egypt was Ra, the Sun-god, who was not, however, the first of the Dynasty of Gods who ruled the land. His predecessor on the throne was Hephaistos, who, according to Manetho, reigned 9000 years, whilst Ra reigned only 992 years; Panodorus makes his reign to have lasted less than 100 years. Be this as it may, it seems that the "self-created and self-begotten" god Ra had been ruling over mankind for a very long time, for his subjects were murmuring against him, and they were complaining that he was old, that his bones were like silver, his body like gold, and his hair like lapis-lazuli. When Ra heard these murmurings he ordered his bodyguard to summon all the gods who had been with him in the primeval World-ocean, and to bid them privately to assemble in the Great House, which can be no other than the famous temple of Heliopolis. This statement is interesting, for it proves that the legend is of Heliopolitan origin, like the cult of Ra itself, and that it does not belong, at least in so far as it applies to Ra, to the Predynastic Period. When Ra entered the Great Temple, the gods made obeisance to him, and took up their positions on each side of him, and informed him that they awaited his words. Addressing Nu, the personification of the World-ocean, Ra bade them to take notice of the fact that the men and women whom his Eye had created were murmuring against him. He then asked them to consider the matter and to devise a plan of action for him, for he was unwilling to slay the rebels without hearing what his gods had to say. In reply the gods advised Ra to send forth his Eye to destroy the blasphemers, for there was no eye on earth that could resist it, especially when it took the form of the goddess Hathor. Ra accepted their advice and sent forth his Eye in the form of Hathor to destroy them, and, though the rebels had fled to the mountains in fear, the Eye pursued them and overtook them and destroyed them. Hathor rejoiced in her work of destruction, and on her return was praised by Ra, for what she had done. The slaughter of men began at Suten-henen (Herakleopolis), and during the night Hathor waded about in the blood of men. Ra asserted his intention of being master of the rebels, and this is probably referred to in the Book of the Dead, Chapter XVII., in which it is said that Ra rose as king for the first time in Suten-henen. Osiris also was crowned at Suten-henen, and in this city lived the great Bennu bird, or Phoenix, and the "Crusher of Bones" mentioned in the Negative Confession. The legend now goes on to describe an act of Ra, the significance of which it is difficult to explain. The god ordered messengers to be brought to him, and when they arrived, he commanded them to run like the wind to Abu, or the city of Elephantine, and to bring him large quantities of the fruit called tataat. What kind of fruit this was is not clear, but Brugsch thought they were "mandrakes," the so-called "love-apples," and this translation of tataat may be used provisionally. The mandrakes were given to Sekti, a goddess of Heliopolis, to crush and grind up, and when this was done they were mixed with human blood, and put in a large brewing of beer which the women slaves had made from wheat. In all they made 7,000 vessels of beer. When Ra saw the beer he approved of it, and ordered it to be carried up the river to where the goddess Hathor was still, it seems, engaged in slaughtering men. During the night he caused this beer to be poured out into the meadows of the Four Heavens, and when Hathor came she saw the beer with human blood and mandrakes in it, and drank of it and became drunk, and paid no further attention to men and women. In welcoming the goddess, Ra, called her "Amit," i.e., "beautiful one," and from this time onward "beautiful women were found in the city of Amit," which was situated in the Western Delta, near Lake Mareotis. Ra also ordered that in future at every one of his festivals vessels of "sleep-producing beer" should be made, and that their number should be the same as the number of the handmaidens of Ra.